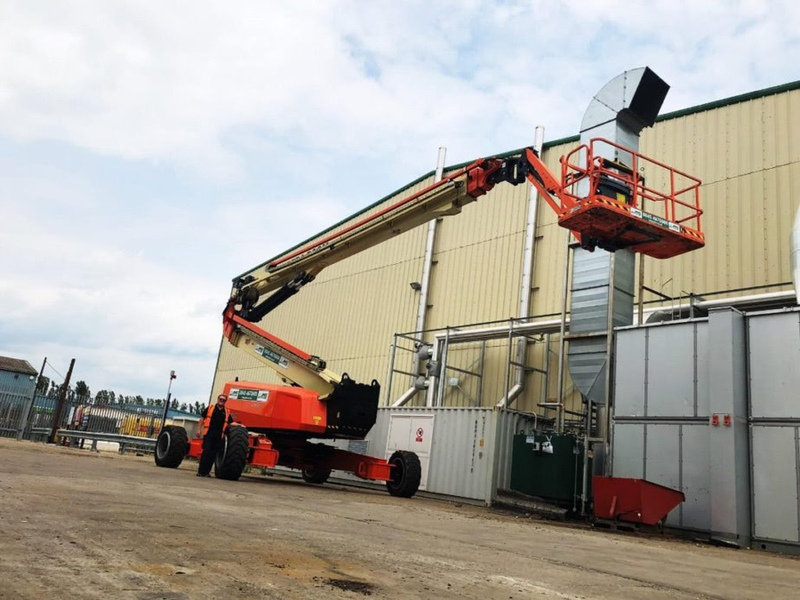 The world’s largest articulated boom – the JLG 1500 AJP – supplied by JMS has proved the ideal choice for roofing contractors carrying out insulation work on a factory roof. The super boom provided excellent platform space and capacity to allow the work to be carried out safely and productivity at an industrial estate in Essex. A JMS operator controlled the articulated boom lift while the roofing team could get on with the task with improving insulation on the roof. JMS Managing Director Mark Jackson said: “Articulated super booms are in increasing demand, and it’s not just because of the heights they can reach. “Their up and over reach gives contractors greater flexibility in the placing of booms in congested spaces like industrial estates. Their stability and platform space also contribute to high productivity levels when working at height. 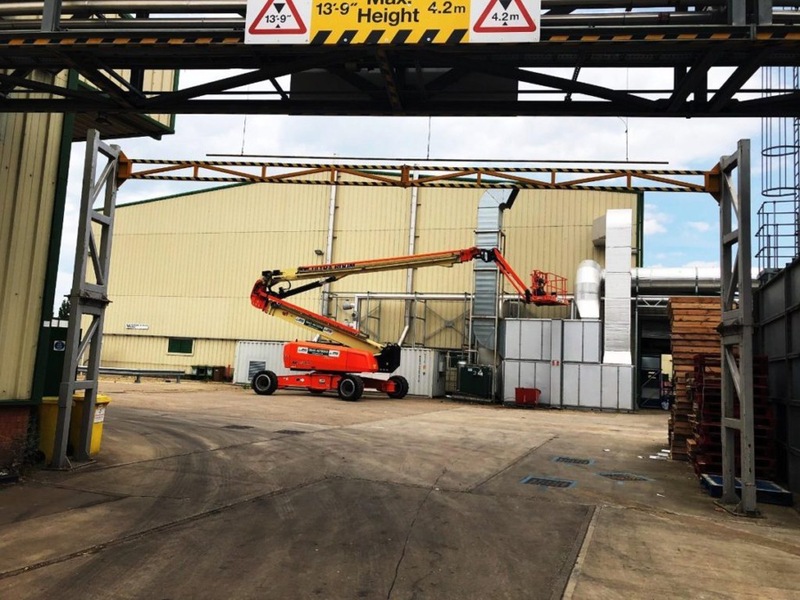 JMS Powered Access Hire – the JLG 1500 AJP articulated boom lift at a factory in Essex. The super boom has a maximum working height of 48.15 metres and an up and over reach of 18.40 metres. Its platform is 910mm wide and 2440mm long, providing excellent working space. It also has a carrying capacity of 450kg. This platform capacity, combined the drivability of the boom lift at full height, means a team can stay working at height for longer, allowing jobs to be completed more efficiently, effectively, and safely. 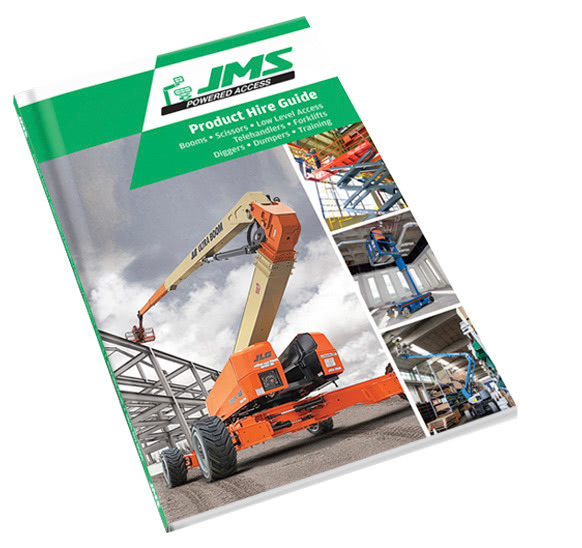 The JLG 1500 AJP gives operators the largest working outreach of any articulated boom lift in the industry, while JLG’s SkyGuard system minimises the risk of operator crushing and entrapment. It’s Quikstik control system reduces time spent positioning the machine. A digital display informs the operator of the machine’s position in the work envelope at all times and wide axle footprint makes the super boom highly stable.